Katten's UK Real Estate group is a key component of the firm's highly regarded Real Estate practice, with 120-plus lawyers across both sides of the Atlantic. 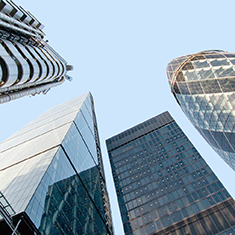 We advise banks, institutions, funds, private investors, owner-occupiers, and property companies on a broad range of commercial real estate and real estate finance transactions. Our group fully understands the importance of having a deep knowledge of local markets and a strong global perspective. Katten's Real Estate practice is one of the most respected in the UK. Our footprint and critical mass of lawyers allows us to provide the full spectrum of real estate services, including debt and equity capabilities. Our clients look to us for real-time market data, plus current real estate sector trends and market standards in sophisticated transactions and negotiations. Investment—acquisitions and disposals across all asset classes, with transactions ranging in size from £10 million single assets to £500 million plus portfolios, joint ventures and other investment vehicle structures, and real estate equity and debt fund transactions. Development—site acquisition, local authority and third-party agreements, pre-lets, forward sale and forward funding, and construction procurement documents. Finance—both lender- and borrower-side representation in bilateral and syndicated loans, financing investments, development financing, loan acquisitions and disposals, and secured lending. Hotels—hotel purchases and sales, including joint ventures, financing, and development, management, operations, and financial agreements. Joint Ventures—shareholder, partnership, and member agreements, development and management agreements, provisional arrangements, and holding entity structures. The UK Real Estate team is proactive and innovative in its approach to helping execute complex deals, often within very tight time frames at very competitive pricing. We also provide project management services in relation to real estate assets located outside the UK and regularly help develop offshore structures that mitigate tax liability. Through close collaboration with our colleagues in the United States and China, we offer access to firm resources that span those regions via our offices in New York, Chicago, Los Angeles, Charlotte, Shanghai and Washington, DC. We also undertake transactions and manage local legal counsel in the Middle East, Africa and India. Advisor to offshore investors in the acquisition of the Welbeck Street car park in London’s West End for a contemplated hotel development. Advisor to a pension fund in forward funding of the development of a retail center in York. Representation of a commercial real estate broker, as receiver, in the £275 million sale of a portfolio of five industrial estates. Advisor to a REIT in the acquisition of a Guernsey Property Unit Trust in the company that owned the long-term leasehold investment of an American conglomerate’s UK headquarters, and in the senior and mezzanine debt financing of the purchase. Advisor to offshore investors in the purchase of multi-let office premises at Millennium Bridge House in central London. Advisor to an overseas family office regarding debt financing and joint venture arrangements for the acquisition of multi-let offices in Manchester. Advisor to several London-based cultural and educational institutions in real estate development, corporate governance and commercial issues, and litigation. Advisor to a global 5-star hotel operator in its successful tender to secure the management agreement for a new ultra-luxury hotel that will be located in the Old War Office, a London landmark that served as Winston Churchill's headquarters during the Second World War. Advisor to global hotel brands and areas, including M&A transactions worldwide.